How to look pretty in pink this spring? The variety of shades of pink on the runway can be overwhelming: from fuchsia, melon, hot pink, rose, rouge to magenta. When I was a little girl, I detested pink as I considered it an infantile and boring option. Three years ago I fell in love with cold pastel pink. Since then clothes in that shade have been a permanent fixture in my closet. This spring, as fashion trends are moving more towards vibrant and fun coloring, I am not resistant to the charm of the hot pink. 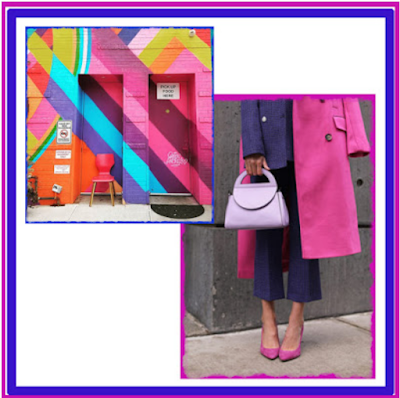 My favorite color mix of the moment is deep navy and hot pink, as it allows you to make you look polished and still make a statement. I spent hours gathering inspirations for this post, and I have never been so sure before that I want to wear every piece I included here. (I purchased the pink coat already.) As spring this year is taking its sweet time to cheer us up with warm temperature and sun, I hope my pink and navy fashion capsules will ease the period of seasonal transition.